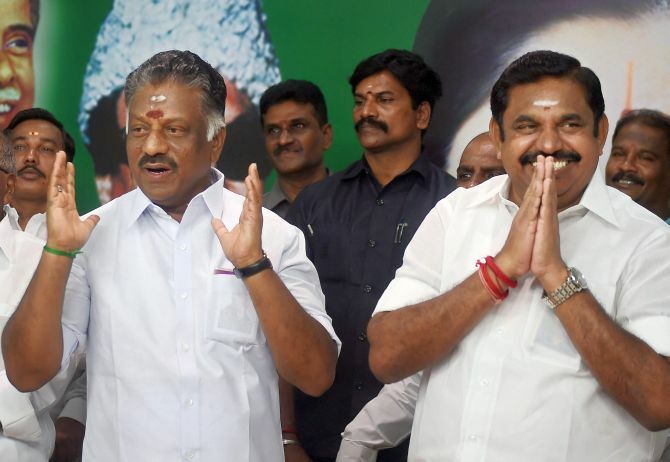 The Madras high court on Wednesday extended till further directions its stay order on a floor test in the Tamil Nadu assembly for the Palaniswami government. Justice M Duraiswamy gave the interim order on petitions filed by 18 rebel All India Anna Dravida Munnetra Kazhagam MLAs loyal to sidelined party leader TTV Dinakaran challenging the September 18 order of assembly Speaker P Dhanapal disqualifying them under the anti-defection law. However, there was no direction by the court on the issue of stay on the disqualification of the MLAs. After hearing lengthy arguments by senior counsels for the petitioners and the respondents, the judge in his order said: the respondents "shall not conduct floor test for the trust vote until further orders of this court". He also ordered: "There shall not be any election notification for conducting the election for the 18 legislative assembly constituencies pursuant to the impugned order dated 18.09.2017, which are the subject matter in the writ petitions until further orders of this court." The judge said the directions were being passed by "consent of both sides" (petitioners and respondents) and posted the matter to October 4 for final hearing. He had on September 14 ordered there will be no floor test for the Palaniswami government to prove its majority till Wednesday. The order was passed after one of the Dinakaran camp MLAs P Vetrivel and Dravida Munnetra Kazhagam Working President M K Stalin, who had filed a petition for a floor test, had then expressed apprehension that the speaker might disqualify the 18 MLAs and it may go in favour of the chief minister in the event of a confidence vote. The petitioners contended the speaker's order was 'unauthorised' and 'illegal' and sought to restrain the respondents -- the speaker, government chief whip S Rajendran, Chief Minister K Palaniswami and the assembly secretary -- from interfering with their rights as elected representatives. The other 10 disqualified MLAs filed their petitions this morning. The judge had on Tuesday agreed for an urgent hearing if petitions were filed. The speaker had disqualified the MLAs on a petition by the chief whip who sought action against them for giving letters to Governor Ch Vidyasagar Rao on August 22 stating that they were withdrawing support to the chief minister. When the matter came up for hearing on Wednesday, senior counsels Dushyant Dave, Salman Kurshid and P R Raman appeared for the petitioners and said the Speaker's order was subject to judicial review and cited the Supreme Court order in a similar case involving former Karnataka chief minister B S Yeddyurappa. "The facts of (former Karnataka chief minister B S) Yeddyurappa case are entirely different from this case," he said. The governor's counsel Rakesh Trivedi submitted that the assembly stands prorogued as of today and the chief minister had not so far sought for a floor test.